Everyone's searching for the secrets to financial success, but what about the best ways to lose money . . . fast?! 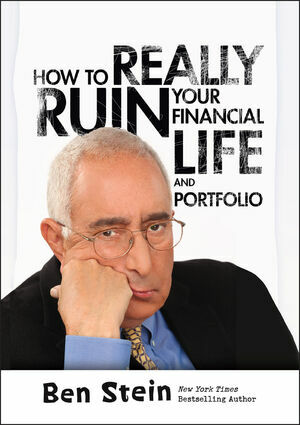 In How To Really Ruin Your Financial Life and Portfolio, bestselling author, economist, financial commentator, and media personality Ben Stein explains exactly what to do . . . to go bust! The ultimate "how-NOT-to" guide, the book gives readers invaluable tips that should be avoided at all costs. Written in Stein's own inimitable style, this hilarious guide provides essential financial advice on what not to do when it comes to managing money. From reading and acting upon investing newsletters to trading on a margin, from investing in bonds to breathlessly following CNBC, and from buying stock in firms you do not understand to believing in your own genius at stock picking to keeping as little cash on hand as possible, Stein presents the rules that every would-be investor needs to know, so they can do the exact opposite and actually make money. Fully revised and updated, this new edition presents all-new missteps that can destroy any portfolio. A laugh-out-loud approach to personal finance, How To Really Ruin Your Financial Life and Portfolio is an accessible guide to money from the funniest man in finance. Ben Stein is a respected economist known to many as a movie and television personality, but he has worked in personal and corporate finance more than anywhere else. He has written about finance for Barron's, the Wall Street Journal, the New York Times, and Fortune, was one of the chief busters of the junk-bond frauds of the 1980s, has been a longtime critic of corporate executives' self-dealing, and has co-written numerous finance books. Stein travels the country speaking about finance in both serious and humorous ways, and is a regular contributor to CBS's Sunday Morning, CNN, and Fox News. He was the winner of the 2009 Malcolm Forbes Award for Excellence in Financial Journalism.